The German Shepherd Dog (also called ‘GSD’, ‘German Shepherd’, ‘Alsatian’, ‘Deutscher Schaferhund’, or even ‘Police Dog’ in some countries) was bred in the late 19th and early 20th century in a concerted effort to breed the ultimate sheepdog. Contrary to popular opinion, it is no more closely related to the wolf than any other breed of dog. A consortium of German breeders worked to make a brave, intelligent dog that could herd sheep and run quickly with great stamina. They produced an agile, powerful dog which quickly showed its usefulness at police work and guarding. During World War I, the breed’s name was changed to ‘Alsatian’ (‘Alsatia’ is a German speaking region of France) to protect the breed against possible anti-German sentiment. This name lasted only briefly in some countries such as America but remains to this day in others. German Shepherd Dogs became the most popular breed in America after the rise of German Shepherd movie star Rin Tin Tin, who thrilled audiences with astounding skills such as leaping nearly 12 feet high. Rin Tin Tin was known to dine on tenderloin steaks prepared by a personal chef. While no longer the country’s number one breed, the incredibly adaptable German Shepherd Dog is today a popular guard dog, police dog, guide dog, search-and-rescue dog, drug-sniffing dog, and pet. The German Shepherd Dog has a shoulder height of 56-66 cm (22-26 in) and weighs 35-39 kg (77-85 lbs). It is a long, muscular dog with a black nose, powerful scissors bite, wide, erect ears, and intelligent, almond-shaped eyes. German Shepherd Dogs have a flat back, bushy, low hanging tail, muscular legs and chest, and short, round feet. They are the image of power and dignity. 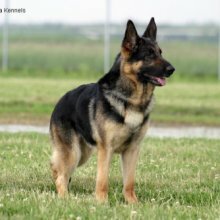 German Shepherd Dogs with a shoulder height over 64 cm (25 in) and weight over 41 kg (90 lbs) are sometimes called ‘King Shepherds’, but this breed is not recognized as distinct by the American Kennel Club. There are three varieties of German Shepherd Dog: coarse and short-haired, coarse and long-haired, and wavy and long-haired. Long-haired varieties may or may not have a double coat. The prototypical German Shepherd Dog is tan with a black back and mask, but German Shepherd Dogs come in a variety of colors including solid black, grey, brown, and yellow, tricolor (black, white, and brown or red), or sable (black and red, silver, or tan), plus a variety of marking designations including ‘penciling’ (black lines on the toes) and ‘tar heels’ (black on the back of the leg). German Shepherd Dogs may not be white, though in some countries this is considered a separate breed. The German Shepherd Dog is unusually intelligent and unconditionally loyal, obedient, brave, and protective. It is known for its fearlessness but it is by no means hostile or aggressive. German Shepherd Dogs are poignant and devoted, making wonderful companions and ideal watchdogs. They are highly versatile and can fit in with many different lifestyles. The German Shepherd Dog is unusually intelligent and unconditionally loyal, obedient, brave, and protective. It is known for its fearlessness but it is by no means hostile or aggressive. German Shepherd Dogs are poignant and devoted, making wonderful companions and ideal watchdogs. They are highly versatile and can fit in with many different lifestyles. German Shepherd Dogs are highly territorial, making them among the least likely of breeds to run away from a fight. They are not friendly towards strangers and will stop unwanted visitors. The German Shepherd Dog gets along fine with children and other animals, provided proper socialization has taken place, but does not prefer the companionship of other dogs. You can find German Shepherd Dog puppies priced from $110 USD to $5300 USD with one of our credible breeders. Browse through our breeder's listings and find your perfect puppy at the perfect price. German Shepherd Dogs are eager pupils and are quick to learn new tricks. They are most responsive to their owner’s voice. The German Shepherd Dog’s versatility makes them suitable for a wide variety of activities including dog sports. German Shepherd Dog Puppies for Sale - Shipped Worldwide! Finding the right German Shepherd Dog puppy can be dog gone hard work. PuppyFind® provides a convenient and efficient means of selecting and purchasing the perfect German Shepherd Dog puppy (or German Shepherd Dog puppies) from the comfort of your home, 24 hours a day, 7 days a week. Take advantage of our PuppySearch or leisurely browse our directory of hundreds of dog breeds, German Shepherd Dog dog breeders, German Shepherd Dog dogs for adoption, and German Shepherd Dog puppy for sale listings with photos and detailed descriptions. Some German Shepherd Dog puppies for sale may be shipped Worldwide and include crate and veterinarian checkup. Many German Shepherd Dog dog breeders with puppies for sale also offer a health guarantee. With thousands of German Shepherd Dog puppies for sale and hundreds of German Shepherd Dog dog breeders, you're sure to find the perfect German Shepherd Dog puppy.